“With COPD the strain is constant. We always get out of breath when doing certain things, day after day. Only when we’re sitting down do we feel up to tackling practically anything." The illness first appeared about 10 years ago. But somehow I didn’t want to believe it was anything serious. Over time I noticed that I wasn’t as fit as I used to be. I coughed a lot but told myself I was probably coming down with a cold. Not only did my physical stamina decline a lot, but climbing the stairs became more difficult and I could no longer carry heavier things. I was generally less able to do more strenuous activities and got out of breath really quickly. But I was still doing quite well. From time to time I got infections and became ill, but I always got better again. Then at the beginning of 2003 I had a serious infection and had to go to the hospital. The doctors there told me that I had pulmonary emphysema. After my stay in the hospital I went to a rehabilitation center. My goal was to quit smoking and to go back home healthy. I had been able to stop smoking in the hospital and could walk short distances again. Then I got a serious lung infection and had to be transferred from the rehabilitation center to an acute care facility. There the head doctor told me that I have COPD, but I didn’t know what that meant. Once I was back home, my family doctor prescribed a stationary oxygen concentrator. I set it up in my apartment. This concentrator draws in air and converts it to oxygen. I mostly needed it at night. I was doing pretty well around then. And I started smoking again. Then I got a serious infection again and had to go to the hospital. On the way to the rehabilitation center afterwards, I wasn’t doing at all well. Then I got angry and decided to quit smoking for good. I threw the lighter and the rest of the cigarettes out of the train window and I have never smoked again since. At the rehabilitation center I got very ill again and had to be transferred to an acute care facility. There they slowly got me back on my feet again. I was given steroids and then I got better. But I have needed extra oxygen ever since that hospital stay. Back home again, I had difficulty coping with all the equipment and, in general, dealing with the fact that I need extra oxygen. Everything had worked well in the hospital. The doctors and nurses took care of me and I had my meals served. I fell into a bit of a slump at home and didn’t know what to do with myself. I felt like I couldn’t do anything anymore. I didn’t want to go out with all the equipment because I was ashamed. If I saw a neighbor standing at the fence when I came home, I would hide behind a tree and take off my nasal tubes and then walk past without them. But things got better in time. I don’t have a problem with it anymore. After a while, I was taken to the hospital one weekend because of breathing problems. I now know that I probably didn’t have an infection, but that my breathing problems were more psychological. Within three weeks, the doctors there managed to give me the courage to go on. I took part in a patient education program for people with asthma and COPD while I was there, and met people with similar problems. It was during this time that I first learned what COPD actually meant, what treatments there are, which medications can help, and exactly what happens with the oxygen supply. The program encouraged me to set goals in my life again. I went home with the goal of becoming active in support groups and taking up sports again. Now there’s both a support group and a sports group in my town, and life is fun again. After the patient education program, I tried to get information, and I read a great deal and talked a lot with my pulmonary specialist and my family doctor. But talking to other people with COPD in the support group was also important. It helped me to accept my illness. Asthma and COPD are often confused with each other. With COPD the strain is constant. We always get out of breath when doing certain things, day after day. Only when we’re sitting down do we feel up to tackling practically anything. There are limitations that we have to live with, for example in places where people smoke. But the most serious limitation for me is that I’m less mobile than I used to be. I don’t have a car. I do everything by bus or train, or as much as possible on foot. But that’s also a good thing because then I have to walk and climb stairs – I live on the third floor. I do sports for an hour and a half twice a week. There I train on the machines, on the bike and on the treadmill. The focus is on stamina and muscle training. We also do breathing exercises and breathing therapy with the trainer. I feel noticeably better after training. The goal isn’t necessarily to build up new muscles, but rather keep the muscles I have. 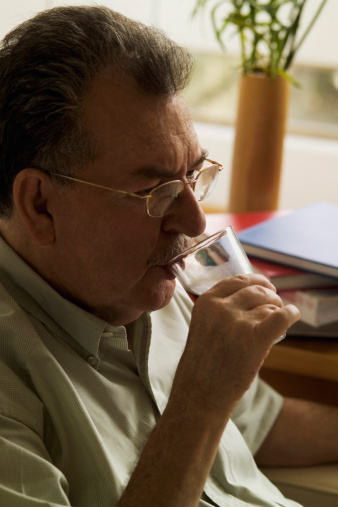 The danger with COPD is that you have no problems as long as you’re at rest. But as soon as you exert yourself, you get out of breath. So the risk is that you avoid physical activity and your muscles shrink. After training we sit together and chat. I find that incredibly important. I take my medicine every day. Different people may use different types and doses of medication. I use two different sprays in the morning and evening, and I also inhale a powder in the morning. I took steroids for a while. But then my doctor decided I should stop taking them because of the state of my health. The only side effects the steroids have are spots on my skin. But I can cover them, they don’t bother me much. We have prepared an emergency medicine kit so I can react immediately if something happens. If I feel an infection developing, then I can start taking medication right away so it doesn’t get too bad. I know what I need to take. I have also learned several breathing techniques. They help me when I’m nervous and have problems breathing. That way I can relax. We agreed that I should do the following: If I have trouble getting enough air I will take the emergency medication as arranged with my pulmonary specialist. Waiting for a certain amount of time and trying not to panic would be the worst thing I could do. If the medication doesn’t help, then the emergency services have to be called. I also measure my peak-flow values regularly and write them down. I do this electronically nowadays. Then I can print the values out at the end of the month or look at all of them in the course of the year. It’s pretty handy. I used to smoke three or four packs of cigarettes a day – so about 60 cigarettes on average. I tried to stop many times – without success. I know how hard it is. When I actually did quit, I made a vow to never touch another cigarette again. Today I no longer have a problem with that. I’ve had fewer problems with coughing since I quit smoking. I only cough rarely and there’s less phlegm. I’ve figured out that I get out of breath more quickly when I’m angry, when I’m excited or when I put pressure on myself or am in a rush. Now I only plan to do a limited number of activities every day. When I’ve finished those, I can always decide whether I want to do something else. Then some things have to be done on other days, or I just don’t do them. You learn this over time and things become automatic. You also learn some tricks over time. When I go out, I often take a walking stick umbrella, even when the weather is good. This helps me when I walk or when I have to stop, so that I can relieve my arm and leg muscles a little. This umbrella is also an emotional support because I know I have it there just in case. I’ve been doing quite well recently and my symptoms are under control. I take the medication as agreed with my doctor so my illness hasn’t gotten very much worse. I haven’t needed to go to the hospital in the last couple of years – it just hasn’t been necessary. Our real-life stories summarize interviews with people who are affected by the medical condition. Our interview partners have given us permission to publish their stories. We would like to express our sincere thanks to them. The real-life stories give an insight into how other people cope and live with a medical condition. Their opinions and comments are not recommendations by IQWiG. Please note: The names of our interview partners have been changed to protect their identity. The photos are of models.